T he pain in Ethan Mascoop’s, left leg was so relentless, the 53-year-old West Roxbury resident had pretty much given up doing the things he loved most — going on long walks, working out at the gym, and candlepin bowling with his wife and son. Mascoop had slipped on the ice three years ago, partially tearing his Achilles tendon, but several rounds of physical therapy failed to tame the pain. So he finally sought an unconventional treatment, which involved withdrawing a tiny amount of his own blood and reinjecting it into his damaged tendon. Within weeks, the pain had subsided. 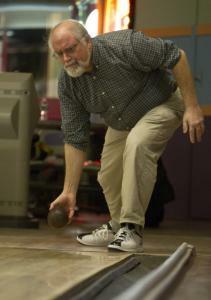 Mascoop, who directs the Framingham health department, was bowling again and planning a trip to the Middle East. “It was an incredible improvement from what I had been living with,’’ he said. With legions of baby boomers like Mascoop increasingly reluctant to just take two aspirin and sit it out on the sidelines, specialists say they are grappling with a corresponding phenomenon — a rising tide of chronic, sports-related injuries. And that is reflected in the nation’s emergency rooms, where an increasing number of adults age 55 and older have been showing up with sports injuries, according to the most recent data from the federal Agency for Healthcare Research and Quality. “We have all these people who have small, partial tears that sometimes progress and need surgery, but often times they are just chronic and don’t get better on their own,’’ said Mascoop’s physician, Dr. Joanne Borg-Stein, who specializes in rehabilitation and sports medicine at Spaulding Rehabilitation Center in Wellesley. The surge is spurring researchers to develop and hone new techniques aimed at helping aging bodies maintain fitness and mend injuries. Many of the new approaches — including platelet-rich plasma therapy, or PRP, which Borg-Stein selected for Mascoop — harness the body’s own healing powers to speed recovery. PRP involves removing a small amount of a patient’s blood and spinning it in a centrifuge for about 15 minutes to separate the red blood cells from the platelets, a type of cell that contains chemicals called growth factors that can help the body heal itself. Then the platelet-rich portion of the patient’s blood is injected in or around a damaged tendon, muscle or cartilage to try to spur the growth of new tissue. Platelet-rich plasma has been used for more than two decades by oral and plastic surgeons to improve wound healing, but over the past few years a growing number of orthopedic and other specialists — not to mention professional athletes — have used it to treat some sports injuries and osteoarthritis. Still considered unproven, the therapy is generally not covered by insurance and costs upward of $750 per round of injections. Many patients, such as Mascoop, need more than one set of injections. A recent flurry of mostly small studies have reached conflicting conclusions about PRP’s effectiveness in sports medicine, though most agree it is safe. A review of the studies, commissioned by the International Olympic Committee and published in November in the British Journal of Sports Medicine, said the conflicting results may be because there is no standardized course of treatment, with wide variations in how specialists prepare the injections and the length of time between an initial injury and the first round of PRP treatment. The authors said much larger, better-controlled studies are needed to know whether PRP truly speeds healing and whether it is effective in the long-term. “If we understand why it works, then we can understand why sometimes it doesn’t work,’’ said Johnny Huard, a professor of orthopedic surgery, microbiology, and molecular genetics at the University of Pittsburgh’s School of Medicine, and a coauthor of the November article. Huard’s research focuses on ways to repair diseased and damaged muscles and cartilage, including those weakened by injuries and by aging. In particular, Huard is working on muscle injuries, which are one of the most frequent type of sports-related injuries. Scar tissue formed after an injury often slows healing and can lead to high re-injury rates and muscle weakness. Huard has been testing several substances in mice to determine whether they can reduce the amount of scar tissue and improve healing. Recently, he tested one of those substances, Losartan, a widely used blood pressure medication, on two injured college athletes, including a football player. Huard’s studies have suggested that the medication can block the formation of scar tissue in mice. “We believe the athletes’ healing has been accelerated, but it’s difficult to say by how much,’’ he said. Huard is planning a larger study to see whether the substance would work equally well in men and women, as well as older athletes. If it continues to show promise, he would also need to pinpoint the optimum timing for treatment. Huard believes substances that block scar-tissue formation could be ready for widespread use in two-to-five years. But in the meantime otherwise healthy patients should not take Losartan, because the appropriate dose is not known and the drug can cause side effects, including difficulty breathing, swelling of the face and throat, and dizziness. Other researchers are studying approaches to help older athletes rebuild muscles that have atrophied with age. One technique being explored is called blood-flow restriction exercise, which uses a tightened cuff, similar to one used to take a blood pressure reading, that is briefly wrapped around an arm or leg during weight lifting exercises. The cuff is tightened to about the pressure applied during a blood pressure reading while a person lifts a weight that is equal to about 20 percent of the maximum weight he or she can typically lift without the cuff on. The lower weight is ideal for older athletes who may also have joint injuries or arthritis that would prohibit heavier lifting. This technique, known as Kaatsu in Japan, is widely used by older adults in that country during workouts, but US researchers say they aren’t sure how it might spur muscle growth and whether it is entirely safe. Blake Rasmussen, a professor of physical therapy and rehabilitation sciences at the University of Texas Medical Branch, has studied the muscle tissue of younger and older adults before and after blood-flow restriction exercise. He said the cuff allows blood flow into the working muscle, but it restricts blood flow back to the heart, and that this appears to trigger the stimulation of a protein responsible for building muscle. The protein is typically activated in younger bodies during weight lifting, but becomes sluggish as we age. Rasmussen found that three hours after exercise, 70-year-olds who had used the cuff had the same activity levels of this protein as 18- to 35-year-olds. “We found the older adults responded the same way as if a younger adult was doing weight lifting,’’ said Rasmussen, who thinks the technique might also help younger athletes rebuild muscles that atrophy after knee and other surgeries. But Rasmussen said much larger, controlled studies are needed before the technique is widely adopted in this country. The American College of Sports Medicine has appointed a committee to spur further research in the Kaatsu approach. Committee chair Michael Bemben, a professor of exercise physiology at the University of Oklahoma, said researchers need to determine Kaatsu’s safety, especially for older adults who may have heart problems.